NDP Leader Tom Mulcair launched a cross-country tour Monday to spread his party&apos;s message that the Senate should be abolished. Mulcair began his "roll up the red carpet" campaign by delivering a speech on Parliament Hill and later in the day he is heading to Halifax. "Today we&apos;re here to mark the beginning of the end of a discredited, outdated and undemocratic institution," Mulcair said during the speech. The NDP says the "unelected Senate filled with insiders and party bagmen has no place in a modern democracy" and it should be scrapped. Mulcair said he will consult with Canadians and work with the provinces and territories to get the upper chamber abolished. "We&apos;re determined to get this done and we will get this done," he said. 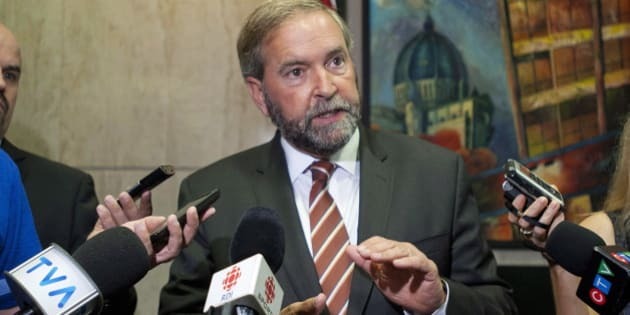 Mulcair spoke to reporters after his speech and said the recent spending scandals involving senators Patrick Brazeau, Mike Duffy, Mac Harb and Pam Wallin have prompted Canadians to reflect on the Senate. "Canadians deserve better," he said.